Sometimes I like my punk straightforward. Give me some power chords, play them high speed, high energy for one to three minutes and I’m a happy man. Sometimes I like my punk a bit different. One thing I enjoy is a guitarist who dares to play something different. Just to give an example, one thing I dig is more surfy licks. Think Dead Kennedys’ East Bay Ray. Now enter Natterers. Natterers is a band from Yorkshire, England. (Not from London for a change.) 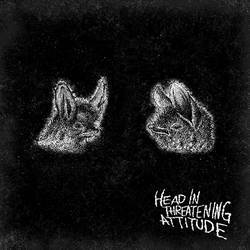 After a few EPs, Head In Threatening Attitude is their debut LP. I’m guessing the title of the record refers to the bat on the right side of the cover, which that bat at least isn’t looking too friendly. A bat on the cover, a bat in the band logo, “What’s up with all those bats?” I thought. So I asked my good friend Google to enlighten me. Natterer is a type of bat that’s very common in Europe. What can I say, I learn something new every day! But enough about that. Let's talk about music. Head In Threatening Attitude is a sweet and short album, even though it has 14 songs on it. They're short songs that don’t overstay their welcome. Most last somewhere between one-and-a-half to two minutes. Of course, there has to be an exception to the rule. That would be “Dead Man Can’t Catcall”. Gotta love the song-title. Music wise I’ve given enough clues in which corner of the punk universe you’ll find Natterers (Knowing Natterers are actually bats makes this a bit of a weird sentence, don’t you think?). They're heavily influenced by Dead Kennedys. This means Natterers has a lot in common with Night Birds and Sun Power. Something that sets them apart from their peers is vocalist Emma. She spews out her lyrics with an ironic sneer that you’ll find with the best in this genre. Both Emma and guitarist Thomas can only shine because of the solid foundation laid out by bassist Rob and drummer Dave. The production also deserves special mention. This album was recorded in France by Guillaume Doussaud at Swan Sound Studio. The mix is spacious, clear, and very powerful. This guy has worked wonders for the sound. I must admit I am becoming a bit of a fan of him. His work with Youth Avoiders was equally amazing. This album is just hit after hit, so I can only urge you to check it out from start to finish. For those of you in a rush: start with “Germs And Creeps,” my favourite track of the bunch. I will play this record a couple more times before I dig into their past performances and check out those EPs I mentioned. I suggest you do the same! Posted Nov. 5, 2018, 8:25 p.m.